Heads-up, auspOp kids! 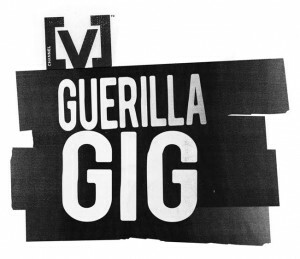 The team behind Channel [V]’s incredible Guerilla Gigs, where a well known musical act drops in to to play an impromptu show somewhere in Australia, has tipped us off that another surprise show is imminent. We’ve been told that the citizens of the city of Melbourne should be on their lookout for the next gig, which is due to happen sometime within the next week. But when, where and with which act? That remains a tightly held secret. To get clues to when and where the next event will take place, head on over to Channel [V]’s OFFICIAL FACEBOOK PAGE, where you’ll receive clues as to the act’s identity and where and when you’ll catch them playing.